This is a flat 5″ tile, sourced from our manufacturers in Stoke on Trent. It is available with a white or cream coloured glaze, as shown. 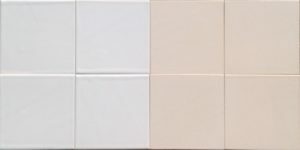 Blank tiles, to complement your decorated ones, are available for £1.90 each. The slight unevenness of this 5″ tile gives a pleasingly rustic, handmade appearance. It is available with a white or cream coloured glaze as shown. Blank tiles to complement your decorated ones are available for £1.90 each. Moulded border tile shown here without glaze. Ask us for samples: To help you decide, we are happy to post out a full set of the four options available. These are supplied at the prices shown plus £2.50 p&p. The cost of samples is deducted from your full commission price if you decide to go ahead.